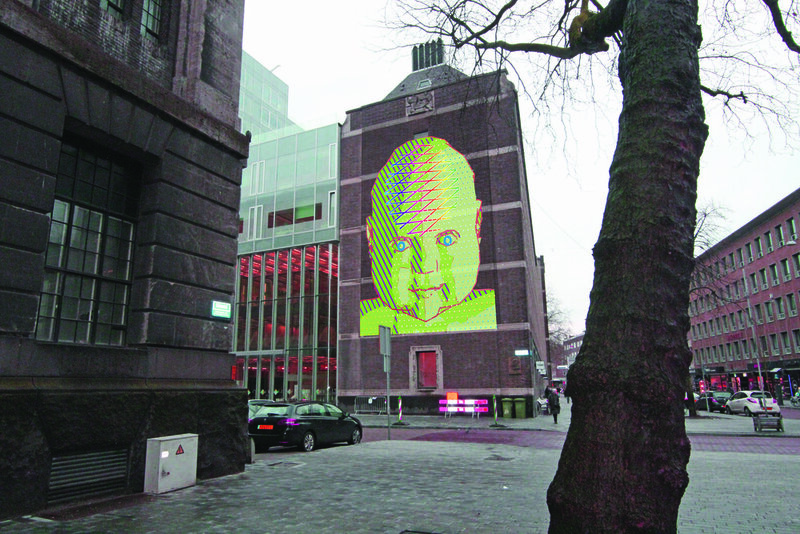 artworks where faces are projected on key buildings with lasers and animations. The highlight of this outdoor expo is the light art installation De Nieuwe Rotterdammer on Schouwburgplein which will be opened on 20 March 2016. 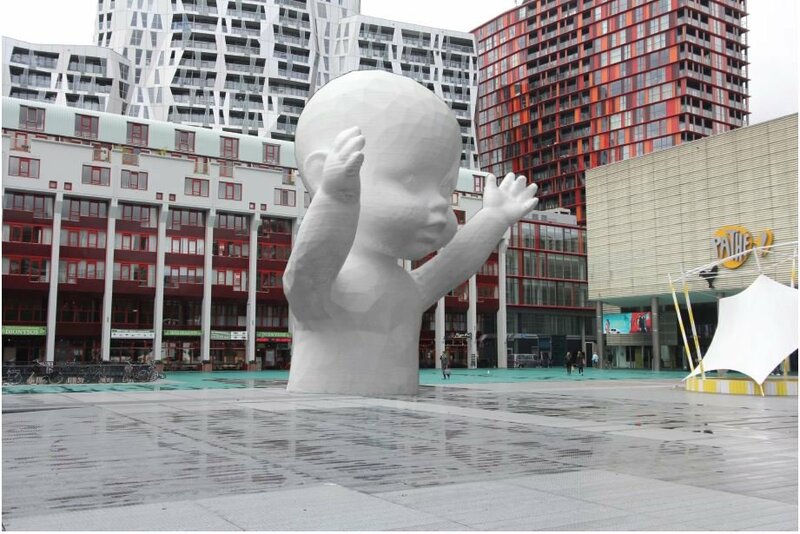 This outdoor expo is part of the series of cultural events Rotterdam celebrates the city! marking the 75th anniversary of post-war reconstruction in Rotterdam. Post-war reconstruction is about so much more than filling the city with roads, parks and buildings made out of concrete, glass and steel. This series of cultural events is intended for the people of Rotterdam, its residents and visitors from the Netherlands and the rest of the world. We collected 75 stories from 75 well-known and unknown citizens of Rotterdam telling you about the history and culture of this city. More than 50 local entrepreneurs will tell their own story by creating attractive shop window displays for this occasion. explore the route with the 75 stories book, a route app developed in collaboration. 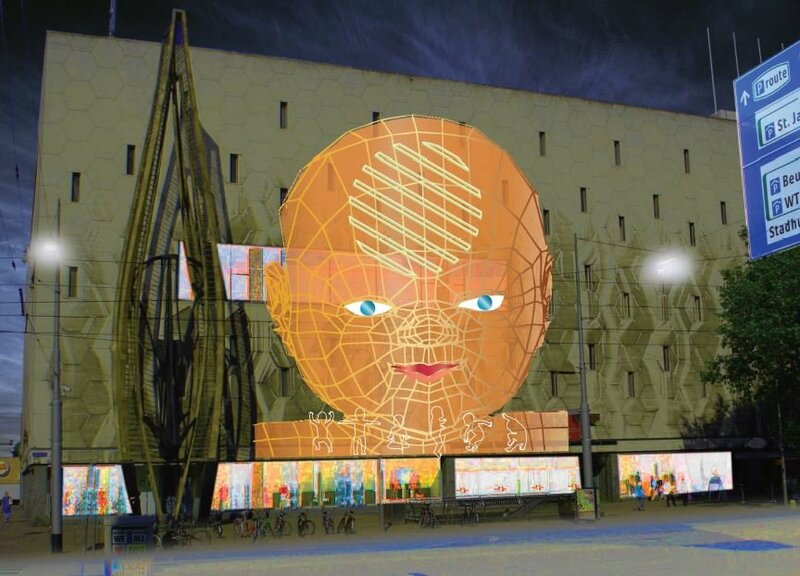 The first Head Light can be admired from 5 February 2016 on Timmerhuis. Museum Rotterdam is opening its new location in Timmerhuis that weekend. Mayor Aboutaleb will open Museum Rotterdam by switching on the lights of the first Head Light. The complete city expo opens on 20 March 2016 with a varied route along Groot Handelsgebouw (next to Central Station), de Doelen, de Bijenkorf, Het Nieuwe Instituut, Maritiem Museum, Bibliotheek Rotterdam (central library) and Timmerhuis. The highlight of this outdoor city expo is the unveiling of De Nieuwe Rotterdammer on 20 March 2016 on Schouwburgplein. This interactive light and laser installation is some 15 metres high and shaped like a young citizen of Rotterdam. This is the symbol of innovation and shows that you can always start again in this city. Just like the city itself that has been reconstructed from scratch. As part of the outdoor city expo Head Lights, visitors can also project images of themselves on De Nieuwe Rotterdammer from 20 March 2016. There will be certain times in the week when this is possible. Please check www.rotterdamcelebratesthecity.com to see when these special moments will be. celebrates the city!. See her contact details below.